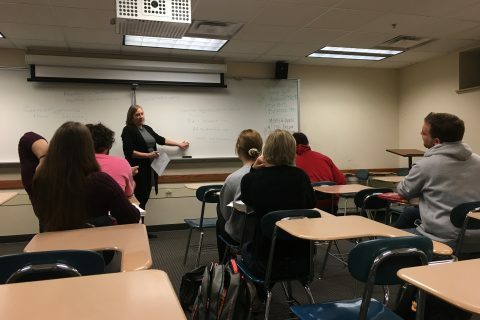 A visit to a recent Latin 115 class began with Assistant Professor of History Kathryn Jasper announcing to the approximately 10 students, “Salvete! Today we are going to learn to express purpose in the coolest way possible!” The students, all sitting at the front of the room, nodded and smiled. While Latin is commonly called a “dead language,” Jasper disagrees. She sees Latin as more than simply grammar to learn, but as a living language. 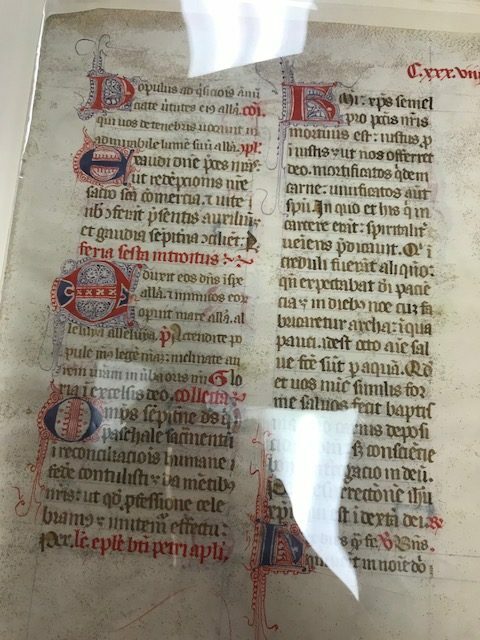 A former Fulbright recipient, Jasper’s Ph.D. is in history and Medieval studies from the University of California Berkeley. She studied Latin over several summers in Rome under Father Reginald Foster, former member of the Latin Letters Department in the Vatican’s Secretariat of State. She models by speaking in Latin to her students during class, and by designating Friday classes as conversation day. “Ubi est Iuliana?” asked Jasper about an absent student as she handed back graded homework. 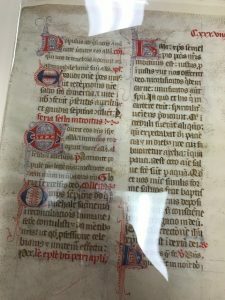 After members of the class replied, Jasper jumped into the day’s lesson with “Vobis placuit manuscriptus” in reference to their recent library visit. 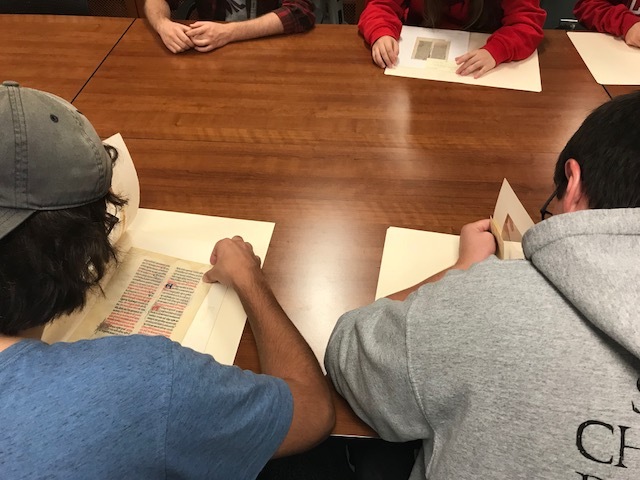 Students study manuscripts at Milner library. 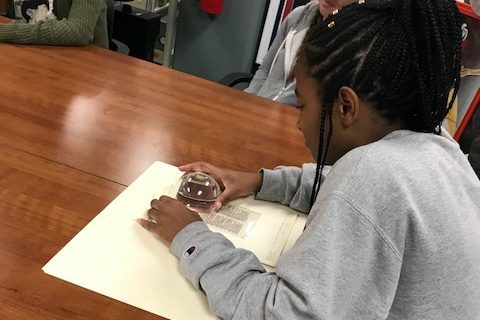 Student using a loupe to view manuscript. 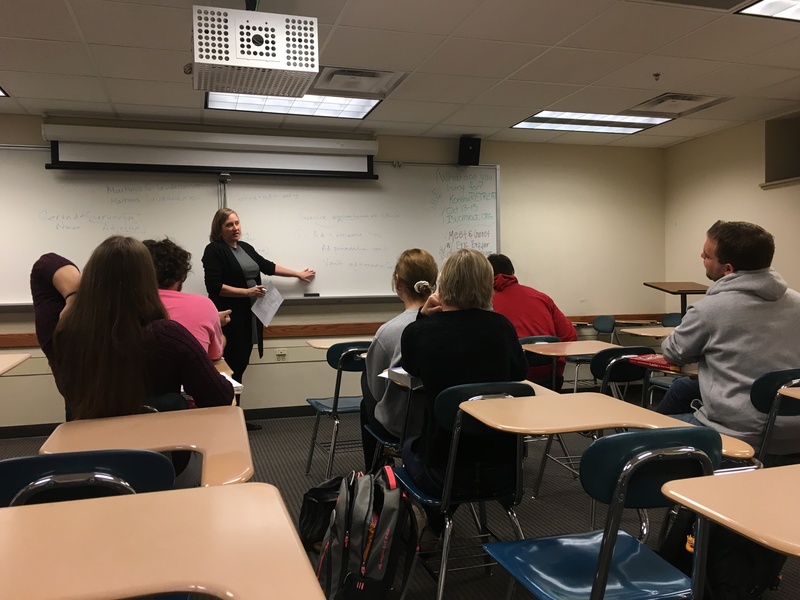 On this particular day in class, students learned a part of speech called the gerund and gerundive in which the verb acts as either a noun or an adjective. “Quid significat?” Jasper asked. (Why know this, why care?) Because it allows you to more specifically explain the purpose (for the sake of, or, in order to). 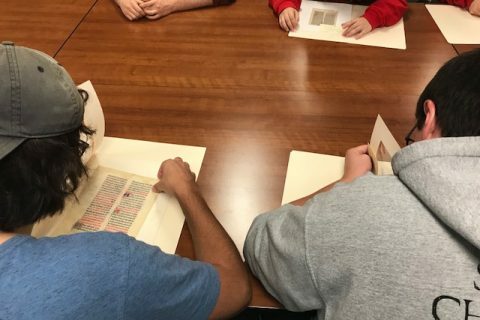 Latin students examine medieval manuscripts and rare books at Milner library. These students are passionate about learning Latin. Class meets at 8:40 a.m. three days a week, and students happily attend. According to one student, “Our class has always been really close. 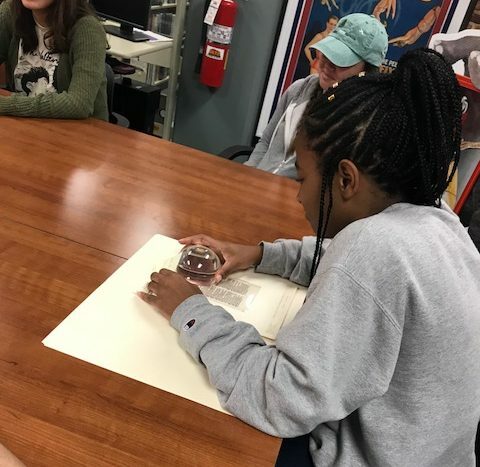 We all started three semesters ago and our class clicked, we just all got along and we all really enjoy Latin.” Languages classes typically remain small with fewer than 25 students, allowing students and teacher alike to get to know each other and learn in a much more personal way. 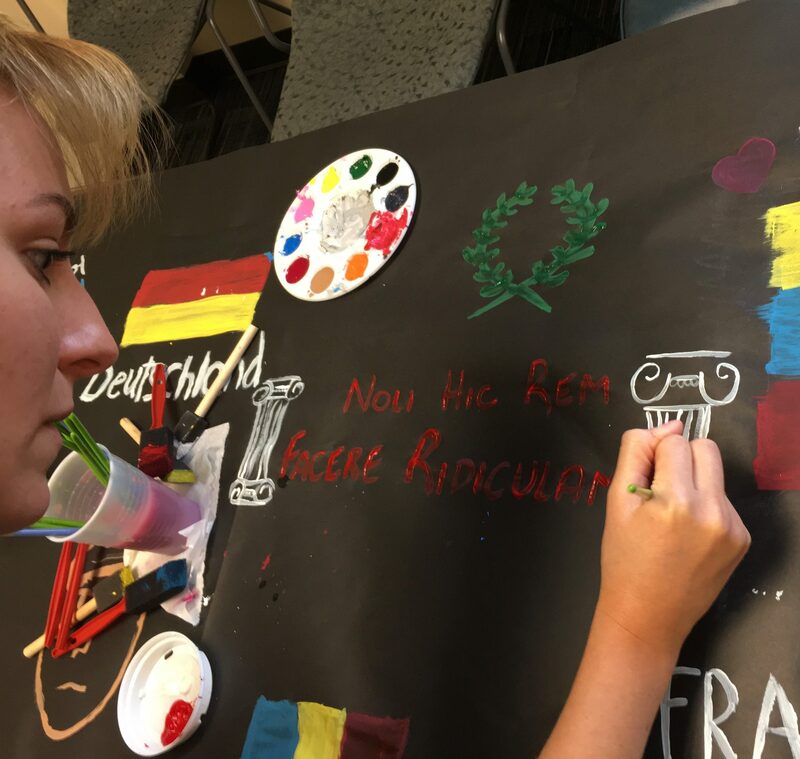 A Latin saying is added to the mural in the new Language Commons in STV 227B. Latin 115 class learns about the gerund/gerundive. Latin Club meets on Wednesdays at 8 p.m., and most everyone from the class takes part. Their main objectives are to talk about Latin. They are also planning a Roman-themed Friendsgiving as well as a Halloween Latin lock-in. Once they figure out a firmer direction for the club they will begin recruiting lower level Latin students. 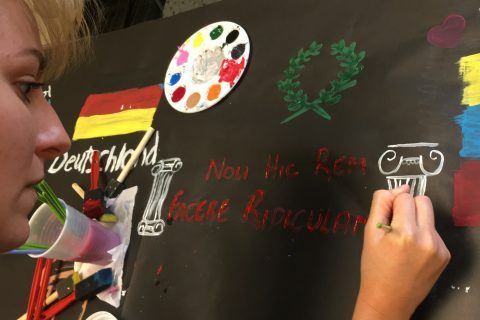 One thing is for sure, for these students, Latin remains very much alive.